In "Kanjincho", after winning the battles against Heike (Taira family), Yoshitsune (Minamoto family – Genji) and his followers are now on the run, escaping from Yoritomo (Minamoto family), Yoshitsune’s eldest brother who became increasingly suspicious of his younger brother. Disguising themselves as mountain priests and porters, they tried to pass the barrier of Ataka on the way to Oshu. Benkei, a faithful retainer to Yoshitsune since they met on the bridge of Gojyu, pretended to read a Kanjincho out of a blank roll of paper to hide their true identity. Kanjincho is a document asking to donors to list their names for the construction of the temple. Seeing him desperately protecting Yoshitsune, Togashi understands. He let them pass knowingly their true identity. Togashi later caught up with the group at night and quietly shares sake (rice wine) with Benkei. Benkei, in return, performs a dance for him. The story is of compassion over duty. 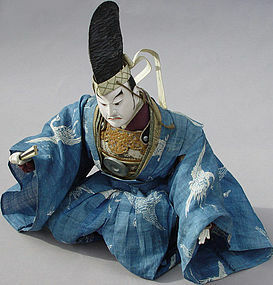 Danjuro (Ichikawa) VII, who played the role of Benkei in the 1840’s Kanjincho, brought many fresh ideas and techniques to Kabuki play. The quality (with historically accuracy) costume worn by the actors was due to his efforts. His efforts were not often without pains. In 1842, he was hand-cuffed and put under house arrest for two months. The reason for the arrest was that he wore a real samurai’s arm and leg protectors on stage. In addition to that, the government expelled him from Edo (Tokyo) when they found out that his lifestyle as a lowly Kabuki actor was similar to the wealthy lord class. He went to Osaka performing on the way. If the script was written as Togashi tearfully deciding to turn them in, Kanjincho would not have been so popular.